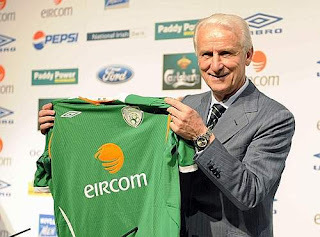 L'allenatore italiano dell'Irlanda, Giovanni Trapattoni, non potrà contare su Robbie Keane per la gara amichevole contro il Brasile del 2 marzo all'Emirates Stadium di Londra. Al suo posto è stato convocato l'attaccante dell'Hibernian, Anthony Stokes. Portieri: Shay Given (Manchester City), Keiren Westwood (Coventry), Joe Murphy (Scunthorpe). Difensori: Richard Dunne (Aston Villa), Stephen Kelly (Fulham), Kevin Kilbane (Hull), Kevin Foley (Wolverhampton), Sean St Ledger (Preston), Paul McShane (Hull), Marc Wilson (Portsmouth), Greg Cunningham (Manchester City). Centrocampisti: Aiden McGeady (Celtic Glasgow), Damien Duff (Fulham), Darron Gibson (Manchester United), Glenn Whelan (Stoke), Keith Andrews (Blackburn), Stephen Hunt (Hull), Liam Lawrence (Stoke), James McCarthy (Wigan). Attaccanti: Kevin Doyle (Wolverhampton), Anthony Stokes (Hibernian), Shane Long (Reading), Leon Best (Newcastle).